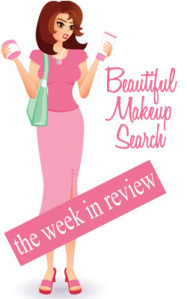 Just in case you haven't been around all week, here is our Week in Review! Mascara Monday - Tarte's Lights, Camera, Lashes! Beauty Duty for October 16th. Sonia Kashuk and Target Team Up for BCA. Update on Benefit's Search for that Gal. The Clinique Happy Special Edition Photo Bottle. Tarte BCA Lipstick in Sweet Dreams. Beth Bender Beauty for Breast Cancer Awareness. Make Up For Ever Diamonds For Ever. WIN THIS: MAC McQueen Collection and Clutch. Benefit's Powder Pop! Combination Set. Philosophy Shower For the Cure Pink Ribbon Shower Gel.